The NC State Veterinary Neurology service offers leading-edge services for patients with disorders of the brain, spinal cord, nerve and muscle. Because disorders of the nervous system are comparatively complex, they require a team of experts that are board certified to ensure their proper diagnosis and treatment. Patients at the Veterinary Hospital are cared for by our highly trained and board certified neurology specialists all of whom are neurosurgeons that can provide unparalleled care with both high field MRI and CT capabilities onsite. Leading edge therapies and outcomes are consistently delivered as we have a dual calling to heal and to teach. Provides care for dogs and cats with neurological disease. Additionally the service will consult and evaluate other species as well. Brain and spinal imaging including MRI, CT, ultrasound, myelography, and survey radiography. Surgical treatment of conditions involving the brain, spinal cord, nerve, and muscle. Electrophysiologic evaluation of the brain, spinal cord, nerve, and muscle function. 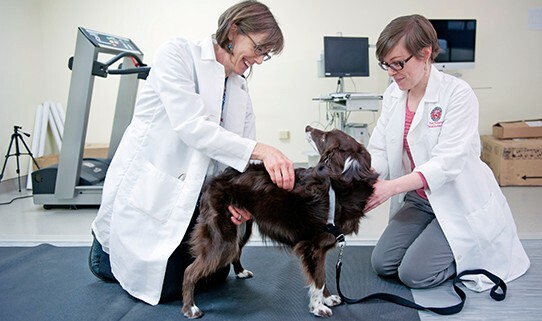 The NC State Neurology Service is actively involved in clinical trials and collaborative research focused on novel approaches to the diagnosis and treatment of neurological conditions of dogs and cats. Areas of investigation include spinal cord injury, encephalitis, chiari-like malformations, hereditary movement disorders, brain tumors, and canine idiopathic epilepsy– a chronic condition affecting some four million dogs that is characterized by recurring seizures. We accept new cases only if they are referrals from a veterinarian. This ensures that the patient is initially referred to the most appropriate service within the Veterinary Hospital. Some cases, particularly orthopedic or cardiac cases, can show very similar signs to neurologic cases. This policy is also important because once discharged from the hospital, we will need to work with the patient’s veterinarian in order to provide continued, high quality care. New patient non-emergency appointments are made on Monday and Wednesday mornings. Emergency cases are seen as needed depending upon the medical condition of the patient and the daily appointment schedule. There is always a board-certified neurologist on call to provide expert consultation and, where indicated, evaluation of emergency cases that present through the Veterinary Hospital emergency service. Our service works on a referral only basis, so the primary veterinarian must first evaluate the patient and then contact our service directly to initiate the referral, if needed. The final arrangements for the date and time of the appointment are usually made directly with the client. If you do not have a referral, ask your primary veterinarian to give you one in order to make an appointment. We prefer to have the owner bring the patient to the neurology appointment rather than delegate this to a friend or relative, as it is often crucial to the management and outcome of the case that an accurate history be obtained. In many cases, this will involve information that only the owner is aware of. For the first appointment at the Veterinary Hospital, please allow 2-3 hours. The visit will start at the admission desk where a medical record is set up for the patient. The client and patient will be met by either a student, clinical technician or veterinarian who will then take the patient’s history information. An initial review of any radiographs, bloodwork or other referral information from the primary veterinarian is also done at this time. It is the owner’s responsibility to ensure that this information is conveyed to the Veterinary Hospital in time for the appointment as the primary veterinarian may not be aware of the exact date of the appointment. A physical examination will then be performed on the patient, followed by a neurologic examination. These may be performed initially by a student, intern or visiting resident. Following this, a neurology clinician (either a neurology resident or senior neurologist) will speak with the client to review the examination findings and to make recommendations on any other specific tests that are recommended to make a precise diagnosis. Depending upon the diagnostics needed and the treatment plan prescribed, the patient may need to be hospitalized for several days. When will the diagnostic tests be performed? It is very important to realize that the major diagnostic tests are often run one or two days after the patient is brought to the Veterinary Hospital. This is done in order to refine exactly which tests will be required and to determine whether the patient can be safely anesthetized. Can a diagnosis be given via a telephone consult? Unfortunately, it is usually impossible to determine a specific diagnosis from a telephone description provided by the client or from the referring veterinarian. In nearly all cases, a full patient history, thorough physical and neurologic examinations, and a series of tests are needed before we can provide a diagnosis for the patient’s condition. What is a neurology specialist? Complete a one-year internship or equivalent training. Complete a residency training program (two or three year depending on the institution). In some schools, such as at NC State University, the residency training includes both medical neurology and neurosurgery. Fulfill the prescribed credentials requirements. Pass both the general Internal Medicine examination and the Neurology certifying examination. Why might I need a neurology specialist? If your pet has a neurological problem of any sort, we would strongly recommend that you seek the advice of a board-certified neurologist. Under the term ACVIM Neurology board certification, a veterinary neurologist is considered to be an expert in neurology, which can include both medical neurology and neurosurgery. Some neurologists have more training in neurosurgery than others, and some neurologists choose not to do neurosurgery. The four neurologists at the Veterinary Hospital are all trained in neurosurgery as well as medical neurology.